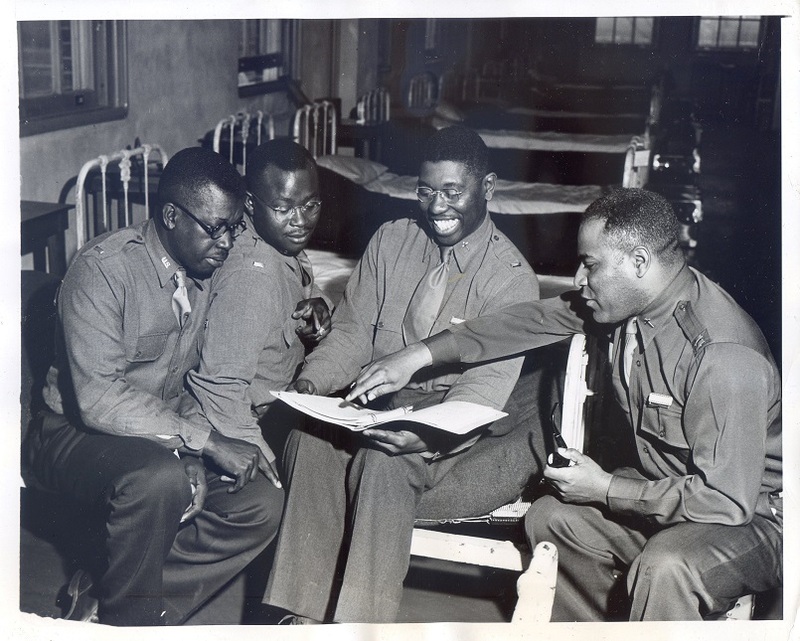 “Colored chaplains are shown reviewing one of the class note books. Left to right: Chaplain Walter S. White, of Sparr, FLA., an African Methodist ; Chaplain George W. Williams, of Sumter, S.C., a Methodist; Chaplain John R. Wesley, of Beauford, N.C., an African Methodist Zion, and Chaplain Capt. John A. Deveaux, of the Regular Army at Ft. Huachuca, Ariz., an African Methodist. 4-9-42” (author’s collection). Fort Benjamin Harrison, Indiana. United States Army chaplain school. Chaplain Martin J. Stein, Lutheran, from Minneapolis, Minnesota, conducting services at the army post chapel, April 1942 (Library of Congress). Chaplain Joseph W. Duane of Albany, New York and Chaplain Fredric Thissen of Minnesota, Catholics, saying mass at the U.S. Army chaplain school. Fort Benjamin Harrison, Indiana (Library of Congress). Chaplain William Beeby, youngest Chaplain at the school, getting ready to leave for his station. U.S. Army chaplain school, Fort Benjamin Harrison, Indiana, April 1942 (Library of Congress). Chaplain P.S. Hall, Episcopalian, of Upper Darby, Pennsylvania, saying mass at the U.S. Army chaplain school. Fort Benjamin Harrison, Indiana, April 1942 (Library of Congress). Chaplain (Major) P.S. Hall, Episcopalian, of Upper Darby, Pennsylvania packing his “mass kit.” This kit was dedicated by Bishop Tucker of the Holy Trinity Church of Philadelphia, and is the authorized official field altar for Episcopal chaplains. U.S. Army chaplain school, Fort Benjamin Harrison, Indiana, April 1942 (Library of Congress). Chaplain Joseph W. Ruane, packing his mass kit after saying Mass. This kit contains all the necessary articles and vestments needed during the Catholic religious services. Many of these kits are distributed by the Chaplain’s Aid Association of New York, and are built for compactness and portability. 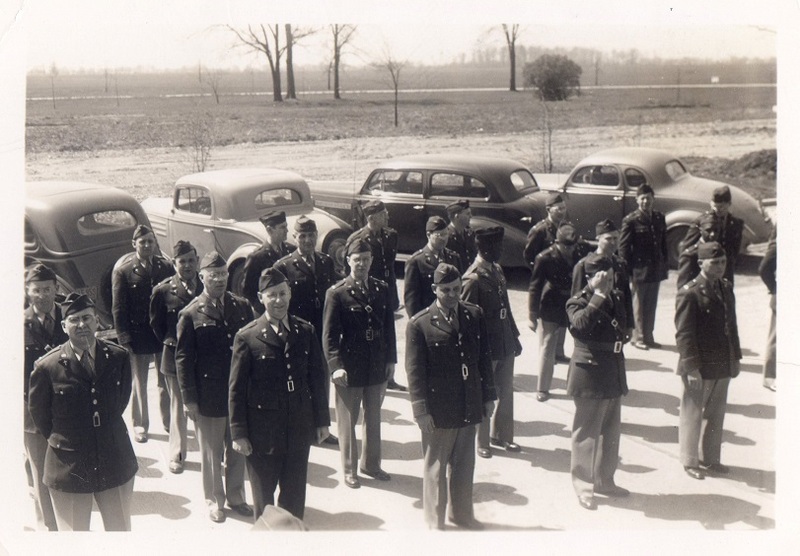 U.S. Army Chaplain School, Fort Benjamin Harrison, Indiana, April 1942 (Library of Congress). 9 Apr 1942: “Chaplains are shown going through military drill. These men will be spiritual advisers (sic) to America’s fighting men, scattered throughout the globe.” Training school for Army chaplains at Fort Benjamin Harrison in Indianapolis, Indiana. “Pictured in their quarters are: Chaplain M.D. Stephens, of tulsa, Okla., a Baptist; Chaplain William Beeby, of Trenton, N.J., a Baptist; Chaplain L.D. Fletcher, of Dallas, Texas, a Presbyterian; Chaplain Arvil Teem, of Oklahoma City, Okla., a Baptist, (typing in background) Chaplain Rudolfe A. Renfer, of Eureka, Calif., a Presbyterian; (typing in foreground), and Chaplain Walter I. Poynton, of Englewood, N.J., a Roman Catholic, who is shining shoes. 4–42” (author’s collection). “In the field. Lieut. 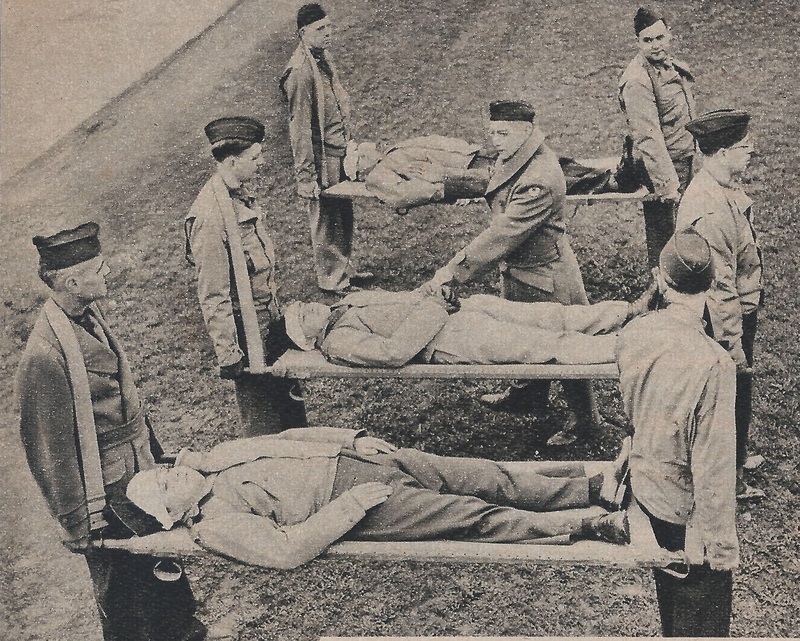 Col. David H. Keller (center), medical officer, instructs members of Army chaplains’ class how to serve as stretcher-bearers and in first aid on a battlefield. Army school has been established at Fort Benjamin Harrison, Indianapolis. (By Wide World)” Photo from “Sunday News, New York Picture Newspaper,” May 17, 1942 (author’s collection). “All puffed up. 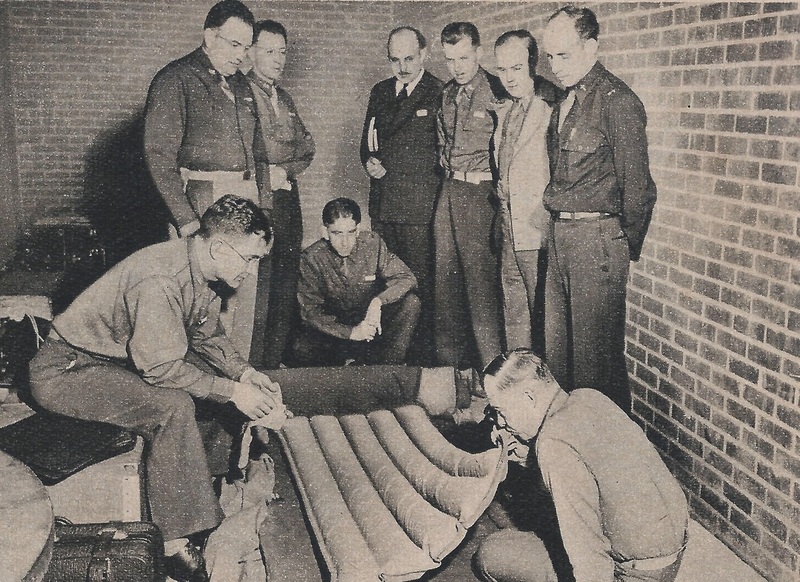 Major P. G. Hall shows chaplain students how to make up a sleeping bag for field service. Men undergo four weeks of intensive training before assignment to post. Candidates range in age from 24 to 45, must have had three years of experience as ministers or priests and must be endorsed by church [sic]. (By Acme)” Photo from “Sunday News, New York Picture Newspaper,” May 17, 1942 (author’s collection). “Self-defense. Capt. 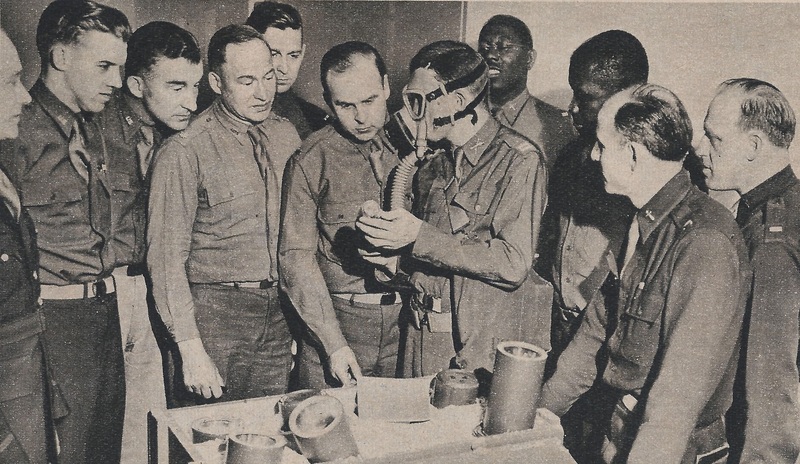 William W. K. Kitchen explains the all important use of gas masks to chaplain candidates. Men must be versed in arts of war as well as peace. (By Acme)” Photo from “Sunday News, New York Picture Newspaper,” May 17, 1942 (author’s collection). 1 “Sunday News, New York Picture Newspaper,” May 17, 1942. 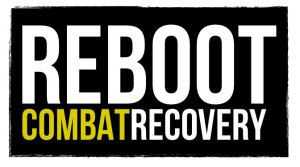 2 U.S. Army Chaplain Center and School website. 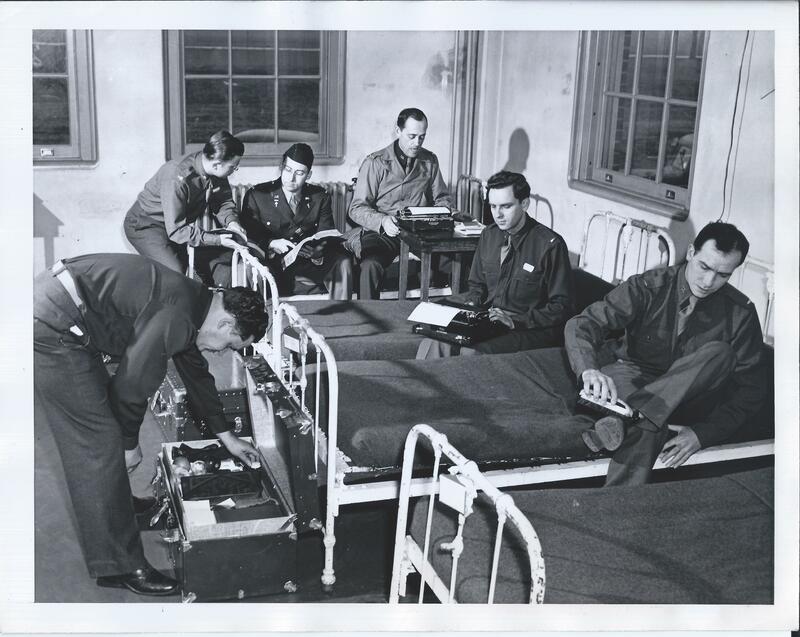 3 Photo caption from photo with chaplain candidates on beds and surrounding area, shining shoes, typing and studying.